Come be swept away by Mini Mirage Theater's majestic innagural production - performed by jaw-droppingly talented teenagers that will make you rethink the concept of "children's theater". Perfect for the entire family to enjoy over the holiday weekend! From the Academy Award-winning team comes a lushly scored retelling of Victor Hugo’s epic story of love, acceptance and what it means to be a hero. 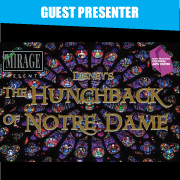 A sweeping score and powerful story make The Hunchback of Notre Dame a truly unforgettable musical and an instant classic. Appropriate for all ages. Everyone entering the theater must have a ticket regardless of age. Group discount available. Contact our Box Office for details.